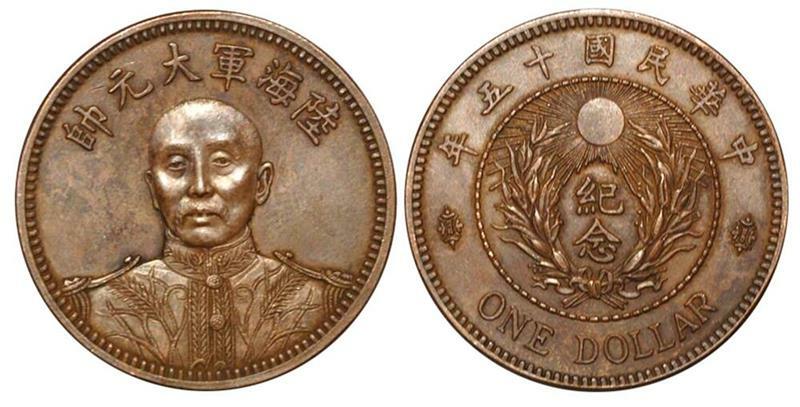 张作霖像民国15年壹圆 近未流通。China, Republican era, Copper Pattern $1, 1926, obverse: Changs bust in military uniform, Commander in Chief of Army and Navy in Chinese characters, reverse: The Fifteenth Year of the Republic of China, sun rays over floral wreath at centre,proof, even toning and extremely rare. During the Peiyang Government era, Chang Cho Lin was the commander of the Fengtien clique. He commissioned a series of four dollar dollar coins of which this type was the first. Spink China sold the issued silver version in April 2014 for HKD$1,380,000 and the other types are rarely seen. In the past ten years or so, two copper pattern coins of this type were sold in Chinese auction houses for prices over 1million yuan. E. Kanns book states that the Chang Cho Lin dollar series does have copper patterns.